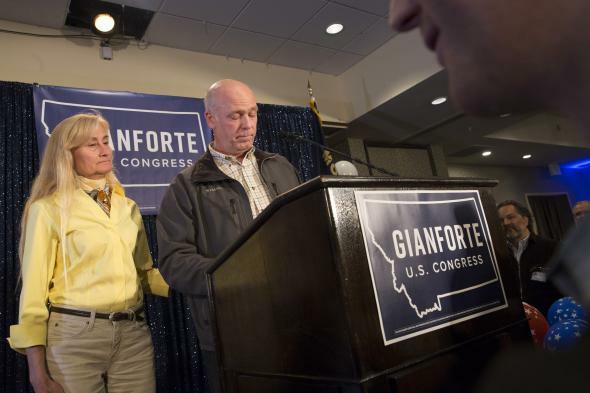 Montana's Gianforte apologizes for body slamming reporter but he wanted to win. Republican Greg Gianforte speaks to supporters on May 25, 2017 in Bozeman, Montana. Montana Republican Greg Gianforte issued an apology Wednesday to Guardian reporter Ben Jacobs for body slamming him during an interview on the eve of the state’s special election last month. “My physical response to your legitimate question was unprofessional, unacceptable, and unlawful,” Gianforte wrote in an apology letter to Jacobs. “As both a candidate for office and a public official, I should be held to a high standard in my interactions with the press and the public. My treatment of you did not meet that standard.” Gianforte also donated $50,000 to the non-profit Committee to Protect Journalists, which, along with the apology, was part of civil settlement with Jacobs. The apology and admission of guilt come two weeks after it would have been the hard thing for Gianforte to do. Gianforte still faces criminal charges for the May 24th assault on Jacobs who was in Bozeman covering the special election to fill the state’s lone congressional seat vacated by Secretary of the Interior Ryan Zinke. “I made a mistake and humbly ask for your forgiveness,” Gianforte wrote. The apology comes two weeks after the Republican congressional canddiate got what he needed—a win in the surprisingly closely fought race with musician Rob Quist—and is a markedly different account of what happened than Gianforte’s team gave before the polls opened the following morning. I’m not sure a belated settlement-induced apology counts as “full responsibility,” but, in 2017, it just might.